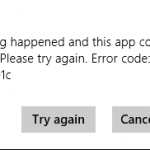 Sometimes while you are using your computer, you might stumble into error codes that look weird and make no sense to you, like for example the Error 0x00000709. Such Errors suddenly appears out of no where and might ruin your mood. When it comes to printers, specifically setting up the default printing device, you might get this error 0x00000709. In this scenario, you will not be able to print documents through your Printer, neither notepad, Wordpad, MS Office Word, Excel or any other software; Pretty sure that is annoying. 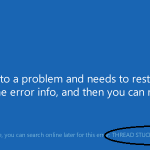 So if you have no clue about where to start in the process of fixing this error, we will try to guide you to how to avoid it and repair it now and when it occurs again. Where did error 0x00000709 come from? 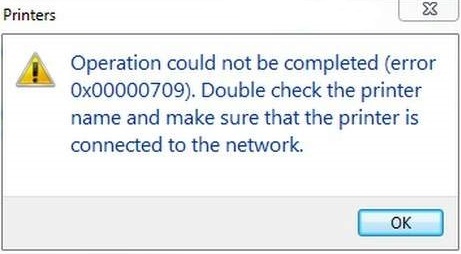 This Windows Error Message box will normally say “Operation Could not be Completed (error 0x00000709). Double check the printer name and make sure that the printer is connected to the network“. In case you are trying to add a network printer but the problem seems more deep than that, often it is because of the Windows registry, which is a low-level settings database that Windows uses to store devices, services, kernel and Security Accounts Manager (SAM) settings. Error 0x00000709 happens when there’s a kind of conflict in the printers registry values that stops Windows from setting up your desired printer as default. Therefore you should consider backing up your registry before following this guide just in case you wrongly mess with values. First of all, we are going to try a method related to the registry because it is more logical that it is the source of the bad in the situation. So let’s go ahead do the steps mentioned below. Click on Start, type in “Regedit” without the quotes, a window should show in the results, go ahead and right-click on it and select “Run As Administrator”, or you can just press the Windows key plus R key. A new Run window will pop up, in the text field type in “Regedit” without the quotes, after that press OK or hit the Enter button. A UAC (User Access Control) window might pop up, just hit “Yes“. On the left panel expand the tree and navigate to the following path: HKEY_CURRENT_USER\Microsoft\Windows\WindowsNT\CurrentVersion\Windows. After that you should see entries with values in front of them, right click “Device” and click on Modify. Under Value data, you should see a line like this “PRINTER,wins pool,Ne00:“. We only need to change the “Printer” to your printer’s name, after that hit OK. If you see a “cannot edit device” right click on “Windows“, select Permissions and check Full Control Box.Repeat the process again. After following all the steps correctly, the 0x00000709 error is more likely to be gone and you can get back at your typing and printing. HKEY_CURRENT_USER\Printers\Settings\Wizard\Locate Type : The value should be changed to 2. HKEY_CURRENT_USER\Printers\Settings\Wizard\Set as Default : Same as well, change it to 2.